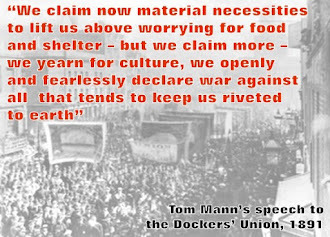 Martin Powell-Davies - teacher trade unionist and socialist: £7 an hour – is that all we’re worth? A poster on the corridors of my daughter’s school caught my eye before the half-term break. “Is all this study worth it?” it asked. 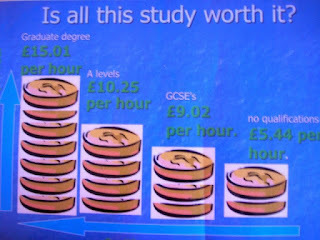 Below, a graph rightly trying to encourage pupils to get as many qualifications as they can, explained how an adult with GCSEs can expect to earn £9.02 an hour on average, a graduate £15.01 per hour. But, while we encourage our youngsters to get on, how many teachers wonder why they are losing out? Official Review Body figures show that teachers are still working over 50 hours a week. Yet a beginner teacher on M1 working outside London earns only £20,133. That’s just £1678 for about 220 hours work a month. That’s £7.63 an hour in gross pay ! I asked a friend in his third year of teaching (in Sussex) what he was taking home a month after tax – it was just £1404. That’s still £7 an hour in take-home pay. So while teachers persuade our pupils to work hard and get a good job with decent pay, the Government seems happy to leave us earning less per hour than the average earnings for an adult with only GCSEs to their name!! Even more experienced colleagues’ earnings still fall well under the graduate hourly earnings average. Long hours and inadequate pay – it’s time for change. It’s time for the Union to have a leadership prepared to give a lead and organise NUT members into taking the action needed to improve both our pay and workload. As I’ve put on the poster sent to schools with my election leaflet, SEVEN pounds per hour for FIFTY hour weeks are numbers that we have to change. That’s why I hope NUT members will use their NUMBER ONE vote to vote for change: POWELL-DAVIES 1.